Germany and Italy are both EU members and in good times, Italy’s growing government sector could mask the harsh economic realities. By comparison to Italy, Germany has abundant energy supplies from nuclear and coal-fueled power and a strong industrial sector. Germany “has”; Italy “has not.” In EU terms, Germany is expected to carry Italy—but they don’t want to. The US “has” abundant energy supplies; the EU “has not.” The EU’s economic crisis provides the US with living proof that we do not want to play in the global-government game where the “haves” are expected to carry the “have nots.” We have the resources; we still have industry; and we still have a good work ethic. Will we use them to save America and the free market system that has allowed us to grow to strength, or will we be drawn into the green big top? Let us clarify what “Cap and trade” is. The definition is in the name. A cap on total emissions is set. Certificates are them issued for the right to emit carbon based pollutants. The sum of emissions allowed by all of the certificates equals the total cap. These certificates are then traded on the open market, between companies, and the value of them is set by the market. This is like the medallion program for taxi cabs in New York city. The city decides how many taxis that the city can handle. Once the certificates, in this case “medallions”, have been issued, they are traded on the open free market. The cap can be as high or low as works. There seems to be no shortage of taxi cabs in New York. If you believe in the free market, then you understand how Cap and Trade is an effective free market solution to managing industrial externalities. There is simply nothing about “Cap and Trade” that is ponzi like. Well, with one exception, that the author has a new word for “I don’t like it.” The author might just as well call it “gay”. 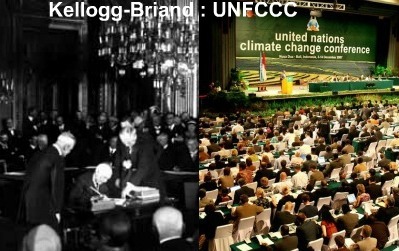 Great piece – man-caused global warming is a scam to help install the United Nations as the new global government, which would funnel money from countries like the United States to poorer countries ostensibly harmed by our use of fossil fuels. Never mind that the warming stopped about 10 years ago, and that our present climate is within the range of natural variation. There is nothing to suggest that we are causing any harmful warming – to the contrary, increased carbon dioxide stimulates plants to grow faster, producing significantly more food for a growing population. Don’t fall for Al Gore’s leftist scam. “Itfitzme”‘s attempt at misdirection, followed by an ad hominem attack, is typical of Leftist debate tactics. National cap and trade is nothing like New York taxi medallions, which function within a strictly defined geographical area. You can’t apply that model to a national regulatory scheme, as the economists who invented cap and trade have explained, and Itfitzme should know that. But maybe he doesn’t want to know. Maybe he prefers his global warming zealotry uninformed.